Beirut (AFP) - Kurdish-led forces on Monday seized a key rebel bastion in Syria's Aleppo province, extending the opposition's losses in the region after a major regime operation there, a monitor said. The Syrian Democratic Forces, an alliance of Kurdish and Arab fighters, seized control of Tal Rifaat from mostly Islamist rebel forces on Monday night, the Syrian Observatory for Human Rights monitor said. The SDF capture came despite Turkey shelling the town to try to halt the alliance from advancing after several days of attacks on the one-time rebel stronghold. It left the rebels in Aleppo with only a few remaining bastions, including the town of Marea, just east of Tal Rifaat, and the border town of Azaz to the north. 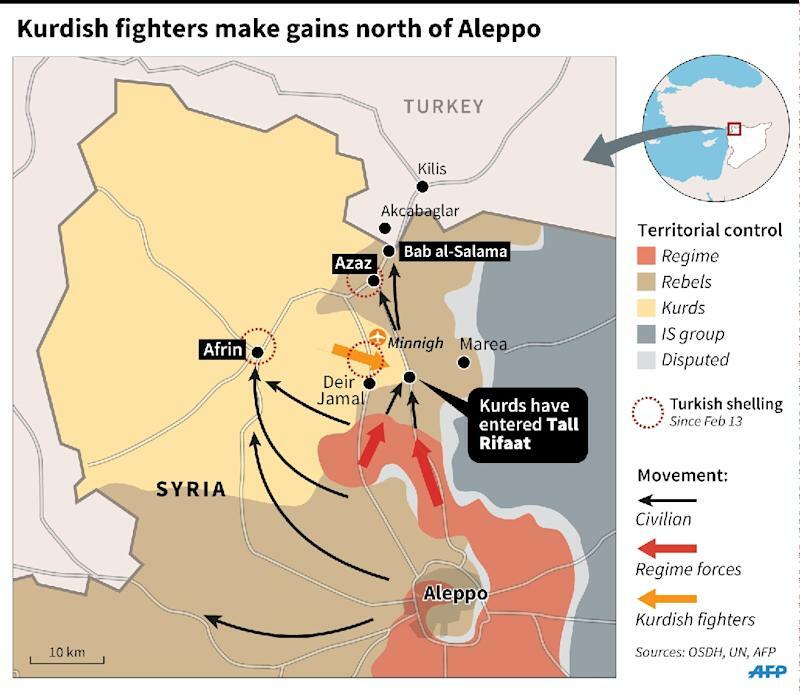 Elsewhere, the rebels have largely crumbled in the face of a major regime operation backed by Russian air power and the simultaneous SDF advance. In recent days, the SDF seized the Minnigh airbase from rebels, and regime forces have virtually encircled the opposition-held eastern part of Aleppo city. The opposition defeats have angered Turkey, a longstanding backer of the uprising against President Bashar al-Assad. Ankara is particularly sensitive about the SDF advances. It views Syria's powerful Kurdish forces as affiliates of the Kurdistan Workers Party (PKK), an outlawed group that waged a decades-long insurgency against the Turkish state. Turkey has shelled SDF positions for the past three days and warned it will not allow Azaz to fall, but so far has been unable to halt the coalition advance. Syria's Kurds have avoided officially siding with either government or opposition during the war, choosing instead to concentrate on building a semi-autonomous region in areas that are largely Kurdish-majority in north and northeast Syria. Their latest advances are part of a bid to unite the Kurdish town of Afrin in western Aleppo province with Kurdish areas to the east. Turkey is strongly opposed to the creation of a united Kurdish region along its border with Syria, and has warned that it is willing to intervene to halt the project.